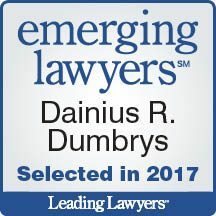 Dainius R. Dumbrys concentrates his practice in general transactional matters, including real estate (residential and commercial), estate planning and probate matters, lending law and general business law. Dainius sees himself as a part of the deal and a facilitator; his intent is to find the most economical and direct solution to a client’s problem, allowing the client more time to focus on the development of their business and saving the client money. Dainius represents individual clients in a wide variety of matters, from the purchase of their first homes to developing a condominium project. He advises clients on the creation of business entities to achieve their goals, as well as agreements between business partners to ensure that their mutual desires are met and their businesses a success. This philosophy and work experience has made Dainius an expert on legal matters affecting the restaurant and hospitality industries in particular, as well as businesses with other areas of specialty. As a part of his practice, he also handles estate planning and probate, important both for peace of mind and, when applicable, for continued business success. In addition to helping individuals and businesses achieve their goals, Dainius works with various lenders on commercial loan transactions of up to $50,000,000.00. This lending work includes the documentation of new loans, the renewal or extension of existing loans and working out issues of forbearance on defaulted loans. Dainius works with a variety of lenders and borrowers based throughout the United States, taking advantage of the vast amount of experience and knowledge available to him at Boodell & Domanskis, LLC. Dainius has been with Boodell & Domanskis, LLC since 2002 and has enjoyed seeing the firm grow and expand its areas of practice. Creation of numerous multi-unit condominium developments and completion of all unit sales and turnover of the homeowners associations. The negotiation of the purchase and sale of several nightclubs, bars and restaurants in Chicago, including coordinating the drafting of all necessary documents for the transfer of ownership and/or assets of the businesses. Negotiation of commercial leases for new businesses, both as landlords and as tenants. Structuring and advising on the creation of new business entities to suit the needs of each specific client and the needs of their new business. Negotiation and drafting of commercial loan documentation for various lenders in Illinois, Kansas, Texas, Florida, Connecticut and New York. Negotiation and drafting of loans between private lenders and various small businesses, securitizing the loans with either real estate, business assets or business ownership interests. Handling the IRS application process for non-profit entities seeking to be registered as IRS 501(c)(3) non-profit public and private charities. Handling all manner of residential and commercial real estate closings for both buyers and sellers. Estate planning and probate in Cook and DuPage counties. Dainius is fluent in Lithuanian and currently holds leadership positions with the Lithuanian Scout Association and several other Lithuanian cultural organizations. Dainius is a member of the American Bar Association, Illinois Bar Association and Chicago Bar Association. For recreation, Dainius enjoys traveling and is an avid skier, golfer and all-around sports enthusiast.